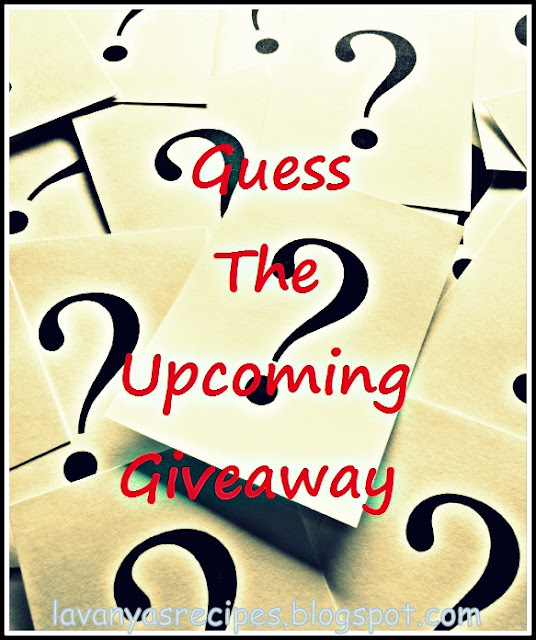 Guess the upcoming giveaway and if you turn out to be correct, you win yourself an additional entry in the giveaway. However, this additional entry will be valid only when you satisfy the mandatory conditions in the upcoming giveaway. This giveaway is going to be a national giveaway and is valid for Indian residents or for people who have relatives/friends in India with a valid Indian address. The giveaway annoucement will be made on 17th Aug,2012 and will last for more than a month. Only one guess allowed per person. So, switch on the best in you and GUESS!!! any celeb's published book ??? Lavanya, I think you have to help me delete my comment..I cannot.there is no option for that. Done shobha. U can go ahead now. makeup or skin care products..maybe in the form of a voucher!! i hope i get lucky atleast this time!! i guess something every women wants in her kitchen ..
Hey Lav, This is an interesting game. is that giveaway going to be a beauty care product?